What happens when a big truck breaks down? A heavy duty tow truck like this one gets sent out! 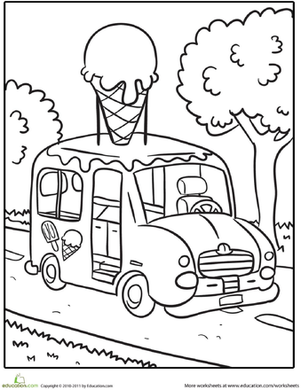 There are great details for your truck-loving kid to colour in in this tow truck coloring page. What do you think this truck might be carrying? There's a big rig truck without a trailer hitched up in back! This is a perfect coloring page for your car-loving kid. 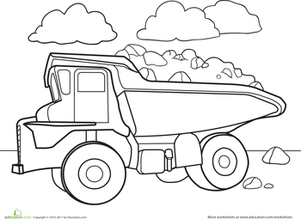 This coloring worksheet features a garbage collector and his trash truck. 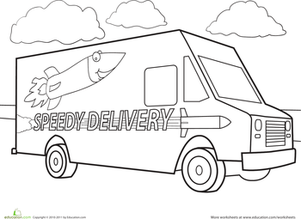 Spend some quality coloring time with a cheerful delivery truck. Counting and drawing practise are wrapped up into this dot-to-dot coloring page of a truck, for when your child can't get outside with his toy cars! 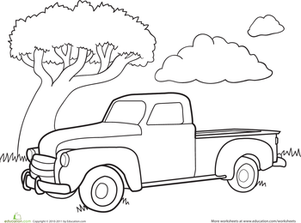 Your young artist can give this truck some colour and context. Finish the drawing however you like.